My listening self is currently adrift in time, split in three ‘ working in the present, listening to pop for pleasure; downloading song after song for this, enjoying right now the summer of ’60, listening for curiosity; and listening to the songs in order to write about them, which doesn’t feel like a duty exactly but is a little daunting. Guy Mitchell’s ‘She Wears Red Feathers’ was a bugger to track down, not surprisingly perhaps since it’s a terrible record, grotesquely jolly and borderline offensive. She not only wears red feathers, she also wears a ‘huley-huley skirt’ and lives on ‘cokeynuts’. The inevitable wedding between this dubious vision and Mr Mitchell naturally takes place with elephants in attendance. Three things vaguely mitigate. It was fifty years ago. There is a tradition of this sort of jungle burlesque in pop, from ‘Stranded In The Jungle’ to the Magnetic Fields. And the cod-exotic flourish that opens the record is pretty exciting. That’s as good as it gets, though, with the orchestra settling quickly into a nasty music hall stomp and the bad jokes arriving by the line. Had it not been for the film Scandal, I’d probably never have heard this song. (Which, in and of itself, wouldn’t be a bad thing.) It’s the musical accompaniment to the scene in which Christine Keeler is discovered by her, um, handlers as she does an “exotic” dance routine in a night club. Interesting that this song should be used to symbolize Tory decadence c.1960. This is why I regret losing the old Haloscan comments since I distinctly remember Tom doing an about-turn over Our Guy in the course of this particular discussion. yes but now we get “jurassic duck” in related FT comments! the wordpress algorithm has a (rather conformist) sense of humour! Bailey’s Glide Watch as well, which I see has nothing to do with improv guitar technique. I did the about turn later I think Marcello, but I certainly did it – I don’t really know how to account for this spasm of POLITICAL CORRECTNESS GONE MAD. By the way if you want a DJ slot on the 10th I have consulted the shadowy Poptimism cabal and it’s yours. Oh bless you Tom – tell the cabal I accept! Marcello, Tom’s about turn wasn’t in the Haloscan comments, it’s in his review of Rock-a-billy so it’s still there. I do remember this from before Scandal – I must do because it was familiar when I first saw that film. What surprises me is that it came so early, I thought it was from much later in the 1950s. Maybe that’s because I’m conflating it in my head with Running Bear although that song doesn’t have the tongue-in-cheek-twinkle-in-the-eye aspect that is almost the outrageous ‘political incorrectness’ of Viz in its prime. 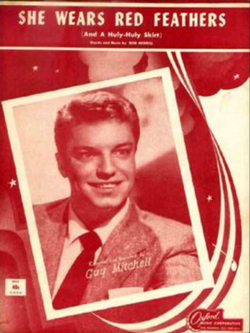 Hey, I like this song and I like just about everything else I’ve heard of Guy Mitchell’s since as he put such joie-de-vivre into everything he did, it seems. Who wrote this song? Was it a British writer by any chance? I recognize this, probably from Ed Stewpot’s Junior Choice. It always sounded like it should be from South Pacific or something like that though I don’t really get the Arabian style intro. Guy’s cheerful delivery & smooth easy style vocal keeps the whole thing afloat and despite some dodgy ‘comedy’ lyrics it manages to just steer clear of the dreaded novelty record tag. “From nine to three they serve us tea” – it’s amazing Bob Merill didn’t die of tannin poisoning long before 1988. But I suppose there’s always the chance She Wears Red Feathers isn’t autobigraphical. His bride’s coconut and fish diet sounds rather modern. I’ve always loved this music hall exotica, and like intothefire I must know it from Junior Choice as it’s one of those super-catchy tunes that’s been stuck in my head for as long as I can remember. And I’d consider having kids just to give me an excuse to sing Guy Mitchell’s Feet Up (no.2, stuck behind Al Martino the year before). Really I would. To give it its full title, “Feet Up (Pat Him On The Po Po).” Let’s not even go there, kids. I’ve just discovered that Bob Merrill not only wrote She Wears Red Feathers and Feet Up, but also Pittsburgh Pennsylvania and If I Knew You Were Comin’ I’d’ve Baked A Cake – so chirpy he makes Alma Cogan seem like Myra Hindley (hasn’t someone already trodden this road?). The poor man was doomed. He ended up shooting himself so you’re right there. Guy Mitchell and Dominic West – possibly related? I can imagine Jimmy McNulty singing She Wears Red Feathers in one of those Irish bar interludes in the Wire (well, first season, anyway). One may mock but I have just heard, on a Radio 4 programme about global warming, an interview with a young woman from the Carteret Islands who, as a consequence of climate change, has nothing to eat but coconuts and fish from the sea. She didn’t say whether she wore a hooly-hooly skirt. This song is a cod-sea shanty in my view. Guy was in the navy for a couple of years at the end of the 2nd World War and possibly this accounts for several of his early 50s songs having a vaguely nautical/piratical/roving theme – “The Roving Kind”, “Belle, Belle, my Liberty Belle”, “Pretty Little Black-eyed Susie”, “Christopher Columbus” In the early 50s large numbers of (mainly) men were in the forces, the 2nd World War was not long over, and the Korean War was in full swing (about 40,000 Americans died in it). All these songs were great sing-along songs for the armed forces. In fact, much of the quirky, over-cheerful and novelty nature of early 50s music can probably be explained by these circumstances. In the UK, add a further ingredient of post-2nd World War austerity – such songs were just right for it until something better (rock’n’roll) came along. Although even rock’n’roll was perceived by many as just another fad – note how early rock’n’roll songs are often defensive and in competition with other “fads” (Mambo, Cha-Cha) at least in the eyes of white US and British fans – examples of apologists for rock’n’roll include Danny and the Juniors’ “Rock’n’Roll is Here to Stay”, Bill Haley’s “Don’t Knock the Rock”, even Cliff Richard’s “Move It”. A fulsome obit – but I’m really not sure about him being proto-rock’n’roll. He was certainly the person most responsible for the strange travelogues (You Belong To Me) and exotic cross-cultural confections (Mambo Italiano) that gave the early 50s a pretty distinct flavour. By the way, She Wears Red Feathers did relatively little in the US (no.19 I think) and Pretty Little Black-Eyed Suzie – a UK no.2 – was on its flip side. Guy didn’t have another Top 10 hit there until Singing The Blues. Afraid I’m in the ‘jolly old Guy’ camp (appropriate word) of thinking. Anything like this makes me grin like an idiot. Next to ‘Doggie in the Window’, it exemplifies “50s novelty pop”. Unfortunately, a white supremacist posted something very un-PC on my Youtube video of this, which I quickly removed. Back in 1953, these kind of ethnic stereotypes were fairly well-meaning. As far as me and some of mates were concerned Guy Mitchell could’nt go wrong in the early fifties, from ‘Roving Kind’ through’Truly Fair’,’Pawnshop’,’Columbus’,’Jubilo’ ‘Look At That Girl’ etc. we bought them all. When we have a knees up ( those of us that are left) we stick on a Guy Mitchell cd. His voice and personality come through, but I was disappointed with the choreography which I found rather lacklustre. He wears the outfit of a London banker of that time – admittedly in keeping with the song’s lyric – and has as props a bowler hat and umbrella, whereas I was anticipating a more exotic arrangement, perhaps something Hawaiian. Also, anyone who carried an umbrella on stage at that time must surely have had to stand comparison with Gene Kelly in Singin’ in the Rain, and that was a difficult act to follow. No doubt the budget for Guy’s performance was minimal and that seems to have been a feature of top quality singers of that time – some of Johnnie Ray’s performances look distinctly bargain basement (see, for example, http://www.youtube.com/watch?v=kCjTWYoRTzM ).